Let students have fun while reviewing short vowel word families! 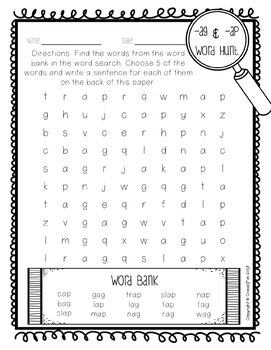 Students will have to be detectives hunting for short vowel words in these word searches! After they find the words in the word searches, they will choose 5 words to write sentences for on the back of the paper. 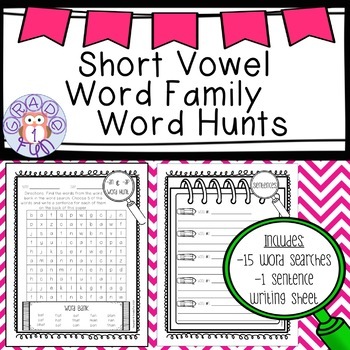 Great for a review week, literacy/word work center, morning work, or homework! 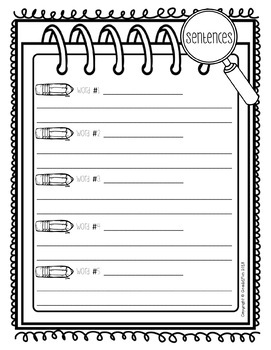 Included in this bundle are 15 word searches and 1 page for sentence writing. Word family combinations included in word searches are: -at & -an, -ag & -ap, -ack & -all, -en & -et, -ent & -ell, -end & -eg, -in & -it, -ip & -ing, -ick & -ill, -op & -ot, -ock & -og, -ob & -ox, -ub & -uck, -ug & -unk, and -ump & -ush. For teaching ideas for your classroom, giveaways, and sale updates, follow me on Instagram, Facebook, and Pinterest! Thank you for visiting my shop! Feel free to email me with any questions, comments, or product requests at Grade1Fun@Yahoo.com!